CamDVR is a Digital Video Recording software designed to work with all kind of video devices and to do a wide range of tasks. The (motion) detector performs image comparisons, face detection and other special tasks. The outstanding features of CamDVR are the permanent video recording and the pre-recorded videos. With the permanent recording feature the software records 24/7 all the activities going on and makes a surveillance system complete. 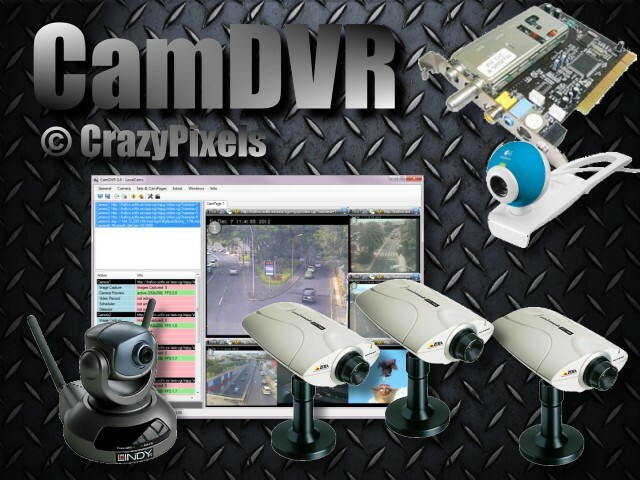 CamDVR is a powerful software solution for all video devices, like IP-Cams, Web cams, capture cards and much more. The program supports an unlimited number of video devices and is capable of recording, live broadcasting over the Internet, doing unlimited surveillance and scheduler tasks. The (motion) detector performs image comparisons, face detection and other special tasks. Using web cameras for surveillance and monitoring is growing more and more popular every year, especially among businesses and home owners. CamDVR turns your PC in a digital video recorder without the need of extra cost intensive hardware. When the program detects motion, it can start one or several pre-adjusted functions. For instance video recording, image capturing, executing specified applications, sounding an alarm, transmitting http commands, uploading files to a web server or notifying a camera owner with an email, among other things. The log of all events is being kept as well. CamDVR highly uses parallel processing to work with all cameras and all functions imultaneously. The program comes also with a function rich scheduler, so all tasks can be programmed in advance. In addition, CamDVR can be set up to monitor only certain areas for motion during specified days or time intervals. The huge repertoire of functions and the low price of CamDVR makes it an ideal solution for all people who wants to own and use a DVR-System (Digital Video Recording). The outstanding features of CamDVR are the permanent video recording and the pre-recorded videos. With the permanent recording feature the software records 24/7 all the activities going on and makes a surveillance system complete. Additional CamDVR is capable to pre-record hidden in the background from each camera, so that in case of a detection this pre-recorded video could be used. Additional CamDVR comes with an integrated Web server and with an integrated Video-Network. Android App CamDVR Viewer for viewing a camera running in CamDVR.